When it comes to detecting neutrinos or particles of dark matter, four noble elements--helium, neon, argon, and xenon--stand out for their standoffishness. When it comes to detecting neutrinos or particles of dark matter, four noble elementshelium, neon, argon, and xenonstand out for their standoffishness. Like the beckoning glow of neon signs in the night, the noble gases hold an irresistible allure for researchers. Shimmering and scintillating, these elitists of the periodic table have properties that seem custom-made for scientists on the track of dark matter particles or nearly undetectable neutrinos. Were most familiar with these elements in their gaseous, room-temperature forms. Helium fills party balloons and turns voices squeaky when inhaled; neon gas, along with other gases that glow in different colors, fills the glass tubing of neon signs. Lined up along the right edge of the periodic chart, helium, neon, argon, krypton, xenon, and radon are known as noble gases for their standoffish refusal to interact with their proletarian neighbors. Unlike the atoms of most elements, each noble atom keeps to itself, refusing to share electrons and form chemical bonds with other atoms. When noble gases are chilled to liquid form, their inert, arms-length nature becomes a real advantage. Purified and poured into a particle detector, they give off flashes of light when particles pass through them. They also allow the trails of electrons left by charged particles to drift unimpeded toward the electrodes that wait to record them. Theyre very nice materials for many reasons, says Stephen Pordes, who works on R&D for noble-liquid detectors at Fermilab. This technology is ripe for exploiting, and there are many active programs. But, Pordes says, many technical challenges remain. His work is cut out for him; harnessing the unique properties of these elements is no easy task. Argon is a wonderful material, says Stephen Pordes, who develops noble-liquid detectors at Fermilab. Helium, the second-lightest element after hydrogen, is already a familiar presence in high-energy physics laboratories. It remains liquid when chilled to almost absolute zero, making it an ideal coolant for superconducting magnets in Fermilabs Tevatron collider and the giant Large Hadron Collider in Europe, as well as in smaller superconducting magnets used in MRI scanners. At those ultralow temperatures, superconducting wires allow electrical current to flow with no resistance and virtually 100 percent efficiency. Heliums lightweight nature is what attracted Debbie Harris and her colleagues. Their experiment at Fermilab, MINERνA, studies how the ghostly particles known as neutrinos act when they encounter elements that are very heavy or very light. Its detector contains a stack of materials liquid helium, lead, graphite, and steel that offer a veritable playground of environments where a beam of neutrinos can interact. 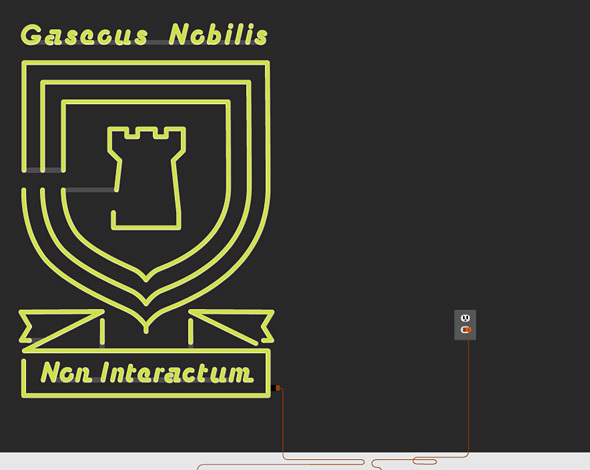 Other researchers bring in the big boys of the noble family. Argon, which makes up 1 percent of the air we breathe, is particularly useful for large-scale experiments. Released as a side product of industrial oxygen purification, argon gas is relatively easy and inexpensive to obtain and has a multitude of applications. Argon lasers have proved useful for electronics manufacturing and retinal surgery, and the gass intrinsic inertness helps insulate double-paned windows and protect wine from oxygen. Scientists have long employed liquid argon in calorimeters, which measure the energy of particles passing through detectors in experiments such as the Large Hadron Colliders ATLAS. Because it is so inert, argon does not absorb the electrons liberated by the showers of charged particles created in the calorimeter; instead, it leaves them free to move toward electrodes for detection, drawn by a high-voltage field. The intensity of the showers and the electric charge they liberate indicate the energy of the particles passing through the detector. In the mid-1970s, physicist Carlo Rubbia was one of the first to conceive a viable neutrino detector using liquid-argon technology. Today, he is the spokesperson for ICARUS, an experiment that contains 600 tons of liquid argon. 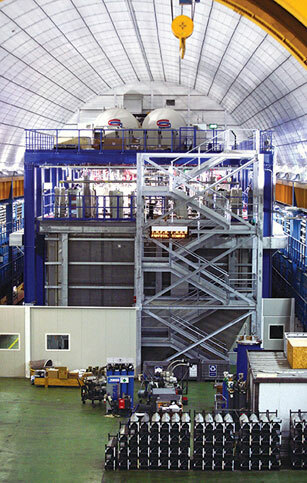 ICARUS started taking neutrino beam data at Gran Sasso National Laboratory in Italy in 2010. The concept behind ICARUS and other liquid-argon-based particle detectors is in some ways similar to that of the bubble chambers used in the early days of particle physics. A neutrino collides with an atom inside the detector and produces charged particles that create tracks as they pass through the detector. In the case of a bubble chamber, the detector contains a liquid held just at the edge of boiling. As the charged particles traverse that liquid, bubbles arise and leave visible, swirling tracks that cameras record on film for analysis. Neutrinos left their tracks in liquid argon in this 2009 image from the ArgoNeuT experiment. Liquid-argon technology allows researchers to skip the steps of operating cameras and maintaining a liquid at the sweet spot just short of boiling. As the charged particles produced by a neutrino interaction move through an argon-filled tank, they leave a breadcrumb-like trail of electrons behind them, invisible to the naked eye. An electric field pulls this trail across the tank toward a grid of thin wires. When the electron trail reaches the grid it electronically imprints its two-dimensional pattern, similar to a shadow projected onto a wall. The time it takes for each electron breadcrumb to reach the grid provides the third dimension and gives the argon tank its name: a Time Projection Chamber, or TPC. Fermilabs ArgoNeuT detector uses a liquid-argon TPC to study the properties of neutrinos. During a short run in 2010, ArgoNeuT recorded a large sample of neutrino events, confirming the effectiveness of TPCs for neutrino detection. Now, Fermilab is developing the 100-ton MicroBooNE detector for a new low-energy neutrino experiment. Fermilab researchers see MicroBooNE as a prototype for even larger and more efficient neutrino detectors in the future. In ICARUS, MicroBooNE, and many other noble liquid experiments, one of argons flashier qualities provides a second way to detect particle interactions (see graphic below). When an ionizing particle hits an argon atom and excites the atom or knocks off an electron, the atom briefly pairs up with a second argon atom to form Ar2. But the union is too much for the introverted atoms to maintain and it quickly falls apart as the atoms electron structure is restored, releasing a photon. Rather than absorbing the photon, neighboring argon atoms allow it to twinkle away as visible light, or scintillation, which photomultiplier tubes convert into electrical signals. While many materials scintillate, argon and xenon are among the brightest. One of the challenges of the technique is developing electronics sensitive enough to measure the output of a large argon chamber. Another challenge lies in purifying the argon; any residual water or oxygen gobbles up charged particles that are drifting toward the detection equipment. To eliminate these impurities, a system continuously filters the liquid argon in the detector. Improving and enlarging purification and detection systems is an intense ongoing R&D effort. Luckily, liquid-argon detectors are more easily scaled to larger sizes than some other technologies, says Yales Dan McKinsey, who works on a dark-matter hunt known as DEAP/CLEAN. If you want a bigger detector, you buy a bigger bucket of argon, he says. Like ArgoNeuT and MicroBooNE, DEAP/CLEANs dark-matter detectors exploit noble liquids as a landing pad for rare particles such as WIMPs, the Weakly Interacting Massive Particles that are the current top candidates for dark matter. We got our tricks from the neutrino business, McKinsey says. The DEAP/CLEAN collaboration is currently running two experiments, MicroCLEAN and DEAP-1, at the Sudbury Neutrino Observatory in Ontario, Canada, with two larger ones, MiniCLEAN and DEAP-3600, expected to take off in 2011. A future and even larger proposed experiment, CLEAN, will detect both dark matter and neutrino interactions. Dark-matter experiments have long been plagued by these background signals, which can look like the signals scientists expect to see from WIMPs (see graphic, above right). Here, the nobles reveal yet another of their useful properties, a scintillation Morse code that allows researchers to discriminate between WIMPs and the background signals that mimic them. A gamma rays passage through argon or neon results in a long flash of light, whereas a passing WIMP would produce a short blip. This difference allows a computer to discard the long flashes and analyze only the potential WIMPs. Blazing in the headlights of a Porsche or illuminating the screen of a plasma TV, xenon, the stranger in Greek, scintillates with the best of them. With three times as many protons as its cousin argon, xenons nucleus presents a larger target for WIMPs to hit. Liquefied, it can pack a dark-matter detection chamber wall to wall with huge nuclei, increasing the chance for physicists to catch one of these rare particles. Theres a high price for this rare, precious element, which was originally formed during supernova explosions: one ton of xenon costs $1 million. Yet its density and large nuclei allow researchers to use less xenon so the apparatus can be smaller. Up to a few tons, xenon detectors are price competitive, says Pordes, and dark-matter researchers are making growing use of them. Dark-matter interactions are even subtler than neutrino interactions, and physicists often spend months looking for a single candidate interaction, says Rick Gaitskell, spokesperson for LUX, the Large Underground Xenon dark-matter experiment. The problem, he says, is that a detector that could pick up more WIMPs would also pick up more false signals from cosmic rays. Immersed in a tank of water, 2000 feet underground in the former Homestake Mine, the 350-kilogram LUX detector will be well protected from any obscuring cosmic radiation. Unlike argon, xenon has no radioactivity of its own and can even shield itself from external radiation because it is so inert. The data samples that researchers trust most come from the central part of the tank, which is the best shielded. The LUX detector, which allows charged particles to drift to a detector in much the same way a Time Projection Chamber does, is scheduled to move underground in late 2011. Expense is just one reason that xenon detectors stay small. Although pure xenon contains no radioactive isotopes of its own, it can become contaminated, and removing contaminants is a crucial and arduous task. Even a few radioactive isotopes of krypton or argon among a billion atoms of xenon could compromise an experiment. No one needs clean more than EXO, an experiment that seeks to determine whether neutrinos are their own antiparticles. The super-rare subatomic decay it hopes to spot would occur even less often than a simple neutrino interaction. Cached in a New Mexico salt mine to protect it from cosmic rays, the EXO200 detector surrounds its liquid xenon with specially extracted and produced copper and acrylics to filter out any trace of radiation. EXO scientists hope that the scintillating xenon isotope in their detector, xenon 136, can cast some light on neutrinos ability to flip between particles and antiparticles. Were married to xenon, Gratta says. For the 200 kilograms of xenon in the EXO200 detector, the EXO group borrowed two tons of the noble gas from a Russian military installation, extracted the xenon 136 that made up 9 percent of it using a Russian centrifuge intended for uranium enrichment, and returned the rest. 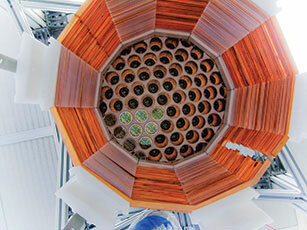 EXO200 began running in 2010, and plans are under way for a bigger detector. Generous amounts of imagination and plenty of painstaking effort will make the next few years an exciting time for experiments with noble liquid detectors. As scientists learn to manipulate these elite substances, the power of using them to search for natures rarest phenomena emerges.